Early this week, I opened the cupboard doors in our cozy makeshift kitchen at Marketing Breakthroughs, only to discover a fun surprise: a well-conceived, appropriately themed marketing piece. And just what was this little marketing gem? 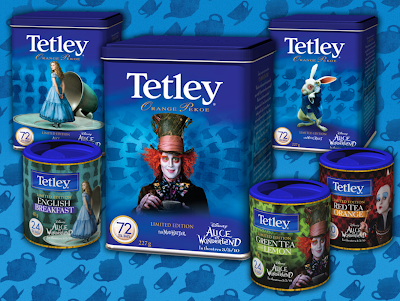 A limited edition Disney’s Alice in Wonderland Tetley Tea tin. Using Canada’s number one tea as a cross promotional tool to hype the new movie and boost tea sales is a nice strategy, as Tetley and Disney are a perfect pairing. When you think of the movie, whether it’s the classic animation we all grew up with from Disney’s original, or their current adaptation from Tim Burton, tea is as Tetley Marketing Director Michelle Faris puts it: “steeped throughout”. It’s a natural marketing extension and one I’m willing to bet will do quite nicely for Tetley. If I could have made one suggestion for the campaign? A plain tin of tea with only two words written on it: Drink Me.